Razer has announced updates to its line of gaming notebooks, the Blade and the Blade Pro. The 14-inch version is called the Razer Blade and the 17-inch model is the Razer Blade Pro. These two new laptops both feature the latest Intel Haswell processors and the NVIDIA GeForce GTX 765M GPU. 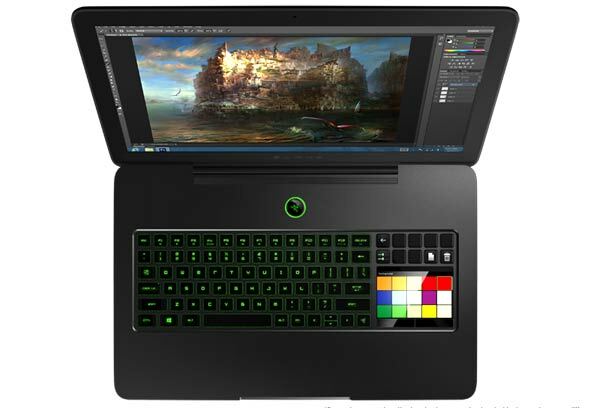 Razer says it has sought to design a laptop with the power only usually found in a chunky gaming laptop but with the slim and sleek premium feel of a modern Ultrabook. This is the 14-inch model. The screen of this laptop is a 14-inch LED-backlit HD+ display with a native resolution of 1,600 x 900 pixels. Alongside the Intel fourth generation processor Razer has installed 8GB of RAM and an Nvidia GTX 765M graphics which has 768 CUDA cores and runs at a base clock of 850 MHz, this GPU is paired with 2GB of GDDR5 RAM. The fixed storage is provided by a 256GB SSD drive. For communications and networking a Killer™ Wireless-N 1202 (802.11a/b/g/n + Bluetooth® 4.0) is installed. All this power comes in a very sleek aluminium chassis which is just 16.8mm thick and overall the laptop weighs 1.88Kg. Another feature which may be appreciated by gamers is the fully anti-ghosted Synapse 2.0-enabled backlit keyboard. The 70Wh battery gives you a claimed six hours of usable time away from a power outlet. When inspecting this laptop one of the first things you will see to make it stand out from the crowd is the Razer Switchblade User Interface LCD touch-panel installed where many 17-inchers put a numeric keypad. This panel can show extra game controls and data. There are a few custom applications for this touch pad area including apps to enhance games such as Skyrim, Battlefield 3 and Star Wars the Old Republic. Outside of gaming-specific uses this second screen can be used as a nifty media player, a multi-touch trackpad or even a number pad. Also creative applications like Photoshop and Maya have accompanying Switchblade UI apps available. Back to the hardware specs, the Razer Pro is “the most portable 17-inch gaming laptop in its class”. This is because it is just 22.4mm thick and weighs 2.98Kg. You can see all the specs on Razer’s site here. Both these new laptops will be available for pre-order in the US and Canada starting from 3rd June. Prices for the Razer Blade with an Intel Quad Core i7 Haswell chip start at $1,799, the Razer Blade Pro will be priced from $2,299. It'll be interesting to know how the 14" copes with cooling. I've an M14X-R2 and it's gimped from a cooling perspective as the CPU and GPU share the same heat dispenser leading to GPU throttling at a certain temperature. That Asian guy freaks me out a little. is Nvidia 765m really good for gaming? its not really a GAMiNG notebook eh?